HI San Diego - Downtown v San Diego, USA: Zarezervujte nyní! 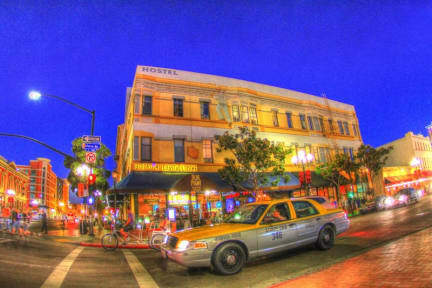 In the heart of the Gaslamp quarter, San Diego's classiest hostel offers everything a backpacker or business traveler could want. Our recently renovated urban hostel offers shared and private rooms, free Wi-Fi, complimentary breakfast, comfortable spaces to meet new friends, and a laid-back staff that aims to make your San Diego experience awesome. Get the most out of your visit to our fair city by checking out our signature weekly events including meal outings, downtown and Balboa Park walking tours, pub-crawls, seasonal trips to the beach and more! Getting here is easy – we’re walking distance from the Amtrak and Greyhound Station and easily accessible via public transportation from the airport or beyond. ***Please note*** - A 10.5% city tax will be charged in addition to the amount quoted to be paid upon arrival. - A $4 Non-Member Fee will be added per night for guests who are not Hostelling International members. Memberships are available at front desk upon check in. - Foreign travelers must show a valid foreign passport at check-in. - United States citizens must show a valid state issued Identification Card or Driver's License with photo upon check in. - We do not rent to residents of San Diego County. - U.S. passports, Foreign Identification and Driver's Licenses, Military Identification and Student Identification cards are not accepted. - Reservations must be cancelled by Midnight the day before check-in. Any cancellations or no-shows after this point will be charged for the first night of the intended stay. Deposits paid are non refundable. - Guests under the age of 18 can only book private rooms.